Colleen Graffy told the BBC the deaths were part of a strategy and "a tactic to further the jihadi cause", but taking their own lives was unnecessary. But lawyers say the men who hanged themselves had been driven by despair. A military investigation into the deaths is under way, amid growing calls for the centre to be moved or closed. Speaking to the BBC's Newshour programme, Ms Graffy, Deputy Assistant Secretary of State for Public Diplomacy, said the three men did not value their lives nor the lives of those around them. Detainees had access to lawyers, received mail and had the ability to write to families, so had other means of making protests, she said, and it was hard to see why the men had not protested about their situation. The men, two Saudis and a Yemeni, were found unresponsive and not breathing by guards on Saturday morning, said officials. They were in separate cells in Camp One, the highest security section of the prison. Ken Roth, head of Human Rights Watch in New York, told the BBC the men had probably been driven by despair. "These people are despairing because they are being held lawlessly," he said. "There's no end in sight. They're not being brought before any independent judges. They're not being charged and convicted for any crime." That view was supported by British Muslim Moazzam Begg who spent three years in Guantanamo. He said of the camp's inmates: "They're in a worse situation than convicted criminals and it's an act of desperation." But earlier, the camp commander, Rear Adm Harris said he did not believe the men had killed themselves out of despair. "They are smart. They are creative, they are committed," he said. "They have no regard for life, either ours or their own. I believe this was not an act of desperation, but an act of asymmetrical warfare waged against us." US officials are facing growing international calls for the camp to be closed down. "If it's perfectly legal and there's nothing going wrong there - well, why don't they have it in America and then the American court system can supervise it?" UK Constitutional Affairs Minister Harriet Harman told the BBC on Sunday. But Ms Graffy said closing down Guantanamo was a "complicated process" which needed to consider what would happen to detainees if the centre was shut down. 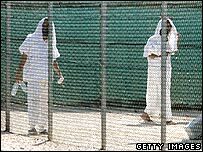 On Friday, Mr Bush said he would "like to end Guantanamo", adding he believed the inmates "ought to be tried in courts here in the United States".